(UPDATE 2: Obituary from the Jackson, TN "Sun"
Tennessee Alpha mourns a tragic death. Any time something like this happens it is terrible. The loss is worse when it is from your own chapter. The fact that this death was alcohol related, and thus avoidable, makes the loss that much worse. Knoxville (WVLT) -- Students at the University of Tennessee are still getting word that one of their fellow classmates has died. Adam Carter, 21, died Saturday morning after a single car crash. 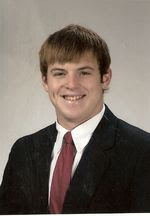 Adam Carter was a senior at U.T. and a member of Sigma Phi Epsilon fraternity. The brothers there are trying to cope with the shocking news tonight. A black banner with Adam Carter's initials hangs over the greek letters at the Sigma Phi Epsilon fraternity house, a traditional sign of mourning. "Everybody takes this loss really hard," said Ryan Hollis, chapter president. Knox County Sheriff's officials say Carter lost control of his ford explorer [...] and hit a tree. Adam was the first friend Jonathan Burlison met when he came to U.T. four years ago. "It's gonna be tough, but as a brotherhood and a chapter, everything's going to be okay," said Burlison. Police say alcohol and speed were a factor in the crash. They also say Adam Carter was driving on a restricted license. My thoughts and prayers go out to Adam's family, the chapter members, and the volunteers who regularly interact with the chapter. No one should have to deal with such a loss. WVLT - Home Knoxville, Tennessee - Breaking News, News, Weather, Sports and Traffic from VolunteerTV.com.